Do you want to start a profitable business in Bangladesh in the wedding industry? Because in everybody’s life wedding is one important occasion which happens once, so any business that is related to a wedding will be always a profitable one. In this sense, wedding cloth renting business in Bangladesh is also not an exception to them. As people never hesitate to spend any amount of money, they want to make their wedding most beautiful and memorable. That’s why don’t hesitate to spend a lot of money as well. You’ll find wedding ceremonies across the world are attached to several businesses. In order to offer the best food to the people who come to attend a wedding, some people invest money in the catering business. Simultaneously, some others offer wedding equipment rental business to decorate a wedding house. This way, wedding cloth renting is a business among them. One of the big reasons to start a wedding cloth renting business in Bangladesh is the business doesn’t need huge capital money. Among the other reasons, the economy of Bangladesh has gotten stronger in the past ten years. That’s why you’ll find many agencies across the country who are specialists in offering wedding dresses to both bride and bridegroom who are about to marry. Also, as it makes your business more accessible to potential clients, the internet reduces your marketing costs and increases your profit margins. So, it requires mostly the knowledge about various kinds of wedding dress for both bride and bridegroom. Also, there are some essential tips and tricks to keep in mind if you want to make profits out of this rental business. For a wedding cloth renting business in Bangladesh, many young girls’ dreams are getting real. This is because all the girls prefer to wear some special wedding dress on their special day. As they’re lucky for wedding dress businesses, they also pay a good price for it. As a result, if you do it right it’s an excellent entrepreneurial opportunity starting a bride and groom cloth rental business. Let’s know what you’ll need to get started the business. As you can start a wedding cloth renting business from your home, it’s one of the easy to start businesses. When you’re in this business continuously, a small scale venture can easily progress into a large one. This is because there is a great demand for this business. But, you must keep in mind that like any other business you should make a great business plan for your business as well. A business plan must include all about your business from bottom to top and good to bad. It means that your business plan is a mirror of your business that will show you the past, present, and future of the business. Not only a business plan saves a lot of money but shows you the way of success as well. The wedding cloth renting business is not only local but seasonal as well. As a result, you’ll want to promote your bridal gown rental business in the same places when it comes to marketing. Also, there are other players in the local wedding market at the same times. So, if you want to generate customer enthusiasm, it’s helpful to focus your marketing efforts on messages and marketing mechanisms. Moreover, it’s important for gown rental providers to participate in their customers’ excitement as a wedding is a happy time. Among the standard marketing targets for serious gown rental entrepreneurs, bridal fairs, wedding guides, and other local resources are best ones. It’s a smart move to see how you will fit in the competitive landscape before you open a bridal gown rental business in your town. You should consider whether your local market large enough to support another bridal gown rental business or not. You had better be sure that you are doing things much better than the competition if the answer if ‘not’. It’ll not be in great demand in a highly affluent area while making a discount on your wedding cloth renting business. Besides, try angling for a niche if your area is already saturated with expensive boutique wedding dress businesses. For example, you can offer your customers gowns made from earth-friendly materials using sustainable practices, or offering only gowns imported from Europe. 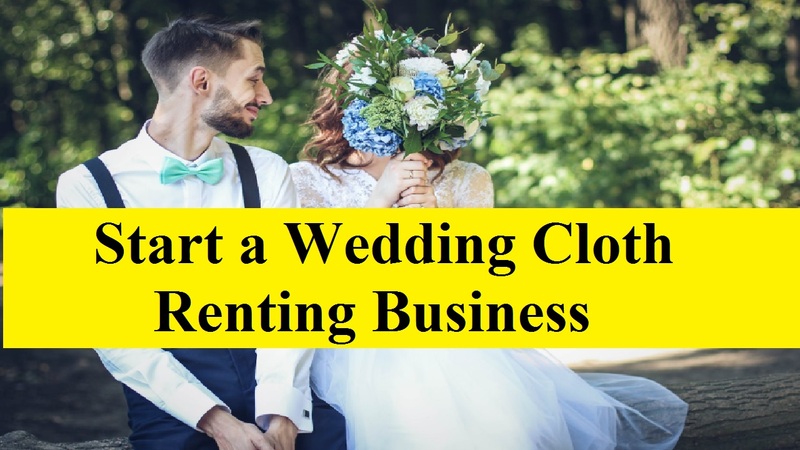 It’s a bustling commercial area near other shops, restaurants and retail stores where you may want to start your wedding cloth renting business. But, if you need a high visibility for your business, you must pay steeper rents for shopping mall locations. That’s why plan for plenty of room to store and showcase gowns because wedding dresses can be voluminous. The points to be considered while choosing are a location, including large dressing rooms, floor-length mirrors, flattering lighting etc. If you want an instant access to a proven workplace routine, think about franchised business startups. Startup entrepreneurs eliminate the guesswork and gain the advantage of established business processes by tapping into a franchise. We recommend visiting websites to determine which franchisors are consistent with your vision and goals for your startup. Most of the company’s revenues are usually dependent on local customers for this type of business. So, you’ll need to craft a business identity to community stakeholders to win the loyalty of local customers. That’s why whatever you do that must actively court local customers.